Postcard US-4036245 from Colorado shows the United States Air Force Academy (USAFA), located in Colorado Springs, Colorado. According to Wikipedia, it is the youngest of the five United States service academies, with its first class graduated in 1959. 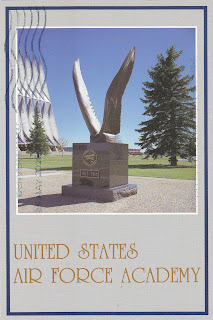 Graduates of the Academy's four-year program receive a Bachelor of Science degree, and are commissioned as second lieutenants in the United States Air Force. The Academy is also one of the largest tourist attractions in Colorado, receiving close to one million visitors every year. President Obama attended the Academy's 2016 graduation ceremony yesterday on June 2, 2016 as the keynote speaker. In his final commencement address of his presidency, Obama shared some of the lessons he learned in the White House as president and commander-in-chief, and warned the graduating cadets about isolationism. The United States Air Force Thunderbirds performed during the graduation ceremony. However, one of its fighter jets crashed on its way back to the Peterson Air Force Base after the fly-over demonstration.